Our team at Gulfstream Lures is much like the powerful Gulf Stream current that flows north along Florida’s east coast. We’re almost always moving, delivering a wide variety of fishing tackle to independent tackle shops from Key West to Jacksonville. At our headquarters in Jensen Beach, we use the finest materials available to produce the hand-tied Gulfstream jigs that anglers use to catch snook, snapper, redfish, pompano, kingfish, cobia, wahoo, sailfish and Spanish mackerel, to name just a few of the fish caught with our products. Gulfstream’s jigs can be found exclusively at local tackle shops, where anglers find friendly advice on where, when and how to fish. You won’t find a Gulfstream Flair Hawk or a Flash Minnow at any big-box retailer. If you’re an angler, we invite you to pick up a Gulfstream jig at your local tackle shop, tie it on and catch a fish. If you’re a tackle shop owner, we invite you to contact Gulfstream for weekly deliveries of a wide selection of fishing products, brought directly to your shop by Gulfstream team members. A native of Pennsylvania, Phyllis graduated from high school in Fort Pierce and began creating jigs for what was then known as Atlantic Lures in 1987. The first jig she mastered was the ever-popular snook catcher, the Red-Tail Hawk. After the company’s name changed to Gulfstream Lures, the number of jigs produced continued to grow under Phyllis. A mother of two, Phyllis takes pride in the fact that Gulfstream jigs are still tied by hand in the United States. She successfully fought former owners’ attempts to follow in the footsteps of other fishing tackle manufacturers by moving jig production to China. Then she made sure customers know were Gulfstream jigs come from by adding Made in the USA and the American flag to the company’s jig packages. Now a partner in Gulfstream Lures LLC with David Ehlers, Phyllis oversees jig production and accounting. She makes sure the warehouse is well stocked when the fish start biting and jigs begin to migrate from tackle shops to tackle boxes. David grew up fishing in Palm Beach County. 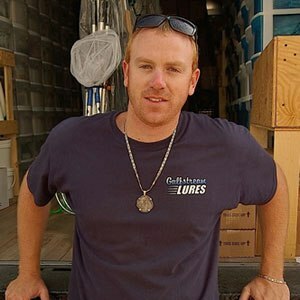 He began his career in the fishing tackle business after graduating from Forest Hill High School in 1996. While studying at Palm Beach Atlantic University, David joined Outdoor Sports World, where he was fortunate enough to learn fishing tackle retailing from the late Howard Elkins. David worked at the popular outdoor store until it closed in 2006. He stayed in touch with the South Florida fishing scene by writing fishing reports for The Palm Beach Post and by co-hosting the South Florida Fishing Report with Snook Nook tackle shop owner Henry Caimotto and more recently, Fred Caimotto. Their popular fishing radio show still airs from 6-8 a.m. Saturdays on Real Radio, 94.3 FM. 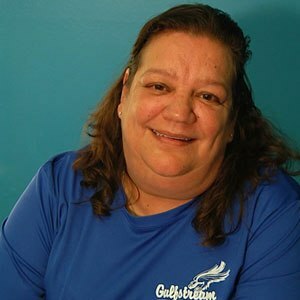 In 2010, David had the opportunity to buy Gulfstream Lures and join Phyllis Humphrey as a partner. David and Phyllis have expanded the business to include distribution of tackle from many manufacturers. Gulfstream trucks deliver fishing gear to more than 180 independent tackle shops. When he’s not working, David enjoys bass fishing with his son and traveling with his family. Vinnie is the Gulfstream sales team member who brings merchandise to tackle shops from Stuart to Jacksonville, a job that keeps him logging about 1,000 miles a week. While growing up in Jupiter, Vinnie fished and played a lot of baseball. He was a pitcher and outfielder for the Jupiter High School Warriors. Vinnie’s baseball talent led to scholarships at Broward Community College and Florida Gulf Coast University. He learned the tackle business while working with Pete and Tommy Schulz at Fishing Headquarters in Jupiter. Before joining Gulfstream, Vinnie played three years of minor league baseball in Indiana. When he’s not working, Vinnie enjoys playing adult-league softball as well as inshore and offshore fishing. He likes to catch mutton snapper offshore and enjoys fishing for snook, trout and redfish in the Indian River. 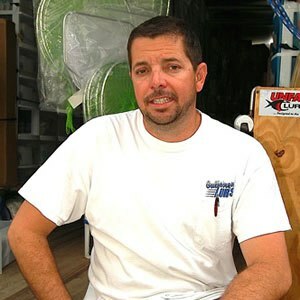 Mark is the Gulfstream sales team member who serves independent tackle shops from Key West to Lake Worth. Mark is a familiar face in the many tackle shops scattered along the Overseas Highway throughout the Florida Keys. Mark leaves home well before dawn on Mondays and drives a Gulfstream truck all the way to Key West, then begins working his way back toward the mainland. His truck loaded with diver down flags, sand flea rakes, cast nets, gaffs, rod-and-reel combos and other tackle, Mark supplies dozens of tackle shops and drives more than 800 miles a week. When he’s not working, Mark enjoys fishing and cooking. He’s a member of the Bad Behavior BBQ Cooking Team that consistently scores well in barbecue cooking contests. 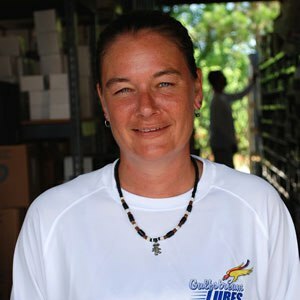 Kelli Lafferty came to Florida as a crew member on a longline fishing boat. When the boat docked in Fort Pierce, Kelli decided to stay in Florida and found work tying jigs with Gulfstream Lures back in the late 1990s. Kelli returned to Gulfstream recently to help the company organize its expanding warehouse – and to help fill a growing number of orders for Gulfstream jigs. “I tie them all,” Kelli said while attaching nylon body hair to one of Gulfstream’s Snook Slayer jigs. When she’s not at work, Kelli studies physical therapy at Indian River State College and enjoys being at home with her daughter and her dog, Hershey. A native of Findley Lake, N.Y., Kelli also enjoys reading at the beach.